I RECENTLY MET UP WITH HIGH SCHOOL CLASSMATE, CHRIS KNAUER. IT HAS BEEN OVER 50 YEARS SINCE WE’VE SEEN EACH OTHER AND VISITED. 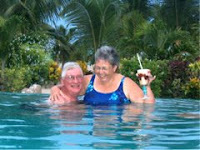 CHRIS AND HIS WIFE KAY ARE SNOWBIRDS SPENDING THE WINTER MONTHS IN PHOENIX AND THE REST OF THE YEAR IN DUBUQUE, IOWA. I WAS AMAZED AT THE NAMES THAT CAME UP DURING OUR VISIT, OF CLASSMATES AND OTHER RESIDENTS OF STOCKTON, ILLINOIS. CHRIS SPENT HIS CAREER AS “CHRIS O’BRIAN” A POPULAR RADIO DJ SERVING NORTHWESTERN ILLINOIS, SOUTHERN WISCONSIN, AND EASTERN IOWA. THAT’S A SALOON AND AN HISTORICAL MARKER. TODAY ASH FORKS IS KNOWN FOR IT’S FLAG STONE MINING OPERATIONS. FROM ASH FORKS I DROVE THE LONGEST REMAINING SECTION OF US ROUTE 66, 140 MILES, COMPLETE WITH BURMA SHAVE SIGNS. TODAY WAS A BIG B-B-Q COOK-OFF AT ROTARY PARK. THEY TAKE THESE COMPETIONS PRETTY SERIOUSLY AND FOR BIG MONEY. CHECK OUT THIS B-B-Q SET UP. THIS IS THE FAMOUS GREEN EGG GRILL. ROTARY PARK MAKES A NICE SCOOTER RIDE, IT’S CLOSE TO THE MOOSE LODGE, AND IT HAS A NICE LONG WALKING PATH THRU THE PARK AND ALONG THE COLORADO RIVER. THE MAIN REASON I WENT TO THE PARK WAS TO GET SOME EXTRA STEPS, AS THERE IS SOME SERIOUS STEPPAGE GOING ON THIS WEEK-END WITH A FITBIT CHALLENGE INCLUDING, LAURA, AMY, MARY, ALAN, AND REX. I HOPE NOBODY GETS BLISTERS. IT’S A TWO DAY RACE TO GET THE MOST STEPS. DAY ONE IS NOT YET COMPLETED AND COMBINED TOTAL STEPS FOR THE FIVE OF US IS 82,684. I’LL LET YOU DO THE MATH, AND GUESS WHO’S IN THE LEAD. WE FINALLY GOT AROUND TO THE LAST ITEM ON THE FALL “TO DO LIST”. OUR GOAL IS TO COMPLETE THE FALL LIST BEFORE CHRISTMAS, AND AS YOU CAN SEE WE FAILED ONCE AGAIN. WHEN IT COMES TO BUILDING, AND POWER TOOLS ESPECIALLY I’M PRETTY GUN SHY. THE PROJECT WAS TO BUILD TWO SHELVES IN THE NEW SHED. THAT’S IT, NO MORE WASTED WARM AND SUNNY DAYS ON PROJECTS THIS SEASON. IT’S BACK TO SCOOTERING AND BEER DRINKING! MARK AND JAYNE, FRIENDS FROM DES MOINES, IA, MADE THEIR ANNUAL TRIP TO LAS VEGAS IN SEARCH OF WARMER WEATHER. WE SPENT A COUPLE OF DAYS ON FREMONT STREET AND VISITED DEATH VALLEY WHERE WE FOUND “SUNNY & 75”. WE HAD A GREAT TIME, BUT “WHAT HAPPENS IN PAHRUMP, STAYS IN PAHRUMP” !!! I’LL POST A COUPLE OF PICTURES, BUT YOU’LL HAVE TO WAIT FOR THE YELLOW RIVER CAMPFIRES TO HEAR THE STORIES. AFTER THREE TRIPS TO VEGAS, I’M IN NEED OF REST AND A POSSIBLE DETOX………. WOW…… I HAVEN’T BLOGGED SINCE CHRISTMAS? WE’VE BEEN BLESSED WITH WARMER THAN USUAL WEATHER HERE ALONG THE COLORADO RIVER THIS WINTER. THAT MEANS MORE T-SHIRT AND SHORTS DAYS, AND I ROLL OUT THE SCOOTER TO RIDE ABOUT FIVE DAYS A WEEK. DURING CHRISTMAS AND NEW YEARS MARY WORKED FOUR DAYS A WEEK, BUT HAS SINCE RETURNED TO WORKING THREE DAYS A WEEK. MY BUDDY MIKEY AND HIS BUDDY BILL WERE SITTING AT ROWDY’S BAR DOWNTOWN PRAIRE DU CHEIN, DRINKING BREAKFAST, AND GETTING PISSED UP AND PISSED OFF WITH THE SUB-ZERO WISCONSIN WEATHER. THEY GRABBED THE SMART PHONE AND BOOKED THE NEXT FLIGHT TO LAS VEGAS IN SEARCH OF WARM WEATHER. SO FOR THE LAST WEEK I’VE BEEN PLAYING TOUR GUIDE. THEY SPENT THE FIRST THREE DAYS IN LAUGHLIN WHERE THE WEATHER WAS IN THE MID-70’S AND CHECKED THE PHONE OFTEN TO SEE BELOW ZERO TEMPERATURES AT HOME IN WISCONSIN, BRINGING BIG SMILES TO THEIR FACES. ON MARY’S DAY OFF WE WENT TO LAKE HAVASU AND TOOK THE FERRY BOAT RIDE ACROSS THE LAKE TO HAVASU LANDING AND CASINO ON THE CALIFORNIA SIDE OF THE LAKE. WE ENJOYED LUNCH LAKSIDE RIGHT UP FRONT AT THE BIG WINDOWS WITH A BEAUTIFUL VIEW. HERE YOU CAN SEE THE LONDON BRIDGE IN THE BACKGROUND OF THE PICTURE. AFTER WARMING UP IN LAUGHLIN, MIKEY AND I HIT FREMONT STREET, DOWNTOWN LAS VEGAS, FOR GAMBLEING, DRINKING, AND SMOKING WITH BOTH HANDS. BESIDES A GREAT TIME WITH MIKEY, I WAS LUCKY THIS TRIP AND NOT ONLY ENJOYED A FREE TRIP TO VEGAS, BUT ALSO WON BACK ALL THE MONEY I LOST ON THE CRAPS TABLE ON MY LAST TRIP WITH MARY A COUPLE WEEKS BACK! NOW I HAVE A FEW DAYS TO REST UP, AND MARK AND JAYNE FLY INTO VEGAS ON THURSDAY FOR THEIR ANNUAL ESCAPE FROM WINTER AND DES MOINES. WE HAVE CHANGED UP THE AGENDA THIS YEAR, AND INSTEAD OF DOING VEGAS AND LAUGHLIN, WE WILL BE DOING VEGAS AND DEATH VALLEY.